If there were an X-Factor style contest for cakes (Cake-Factor, if you will), this would be the one on stage at the end, surrounded by sparkly ticker tape singing ‘You Raise Me Up’. Incidentally, how amazing would a Cake-Factor be? Bagsy head judge. 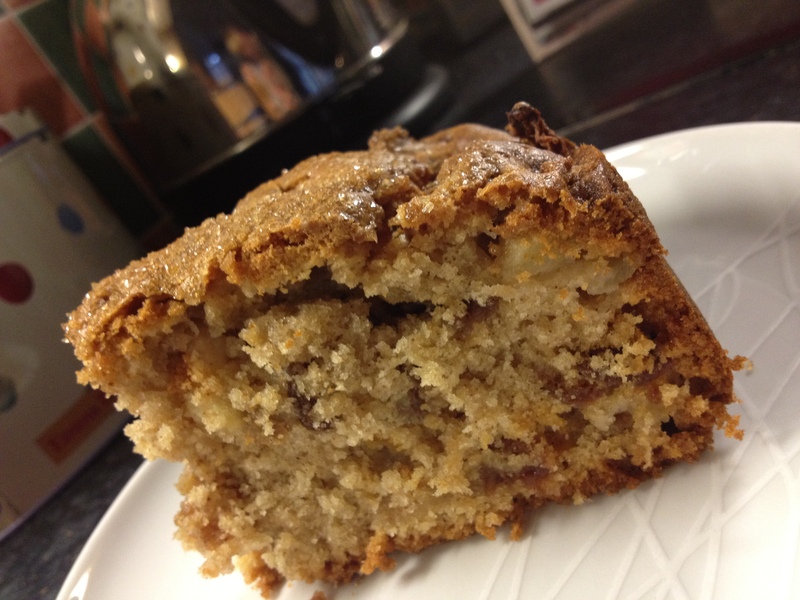 Yep, this is my go-to cake, the one I come back to evey time I need a comforting internal hug of the cakey bakey kind. I first ate it at the christening of a friend’s baby years ago. 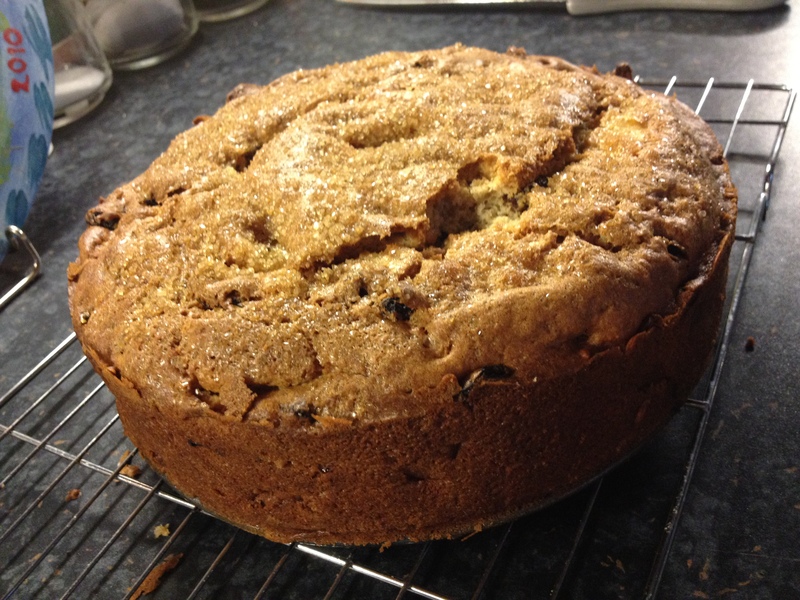 Her Mum had baked it, eshewing the traditional stodgy fruitcake and, my what a good choice. I found the recipe online, adapted from a WI recipe from a member of an online recipe sharing forum. Grease and line a 20cm cake tin. Preheat the oven to gas 4/180 degrees/160 fan. Peel and core the apples then slice finely. 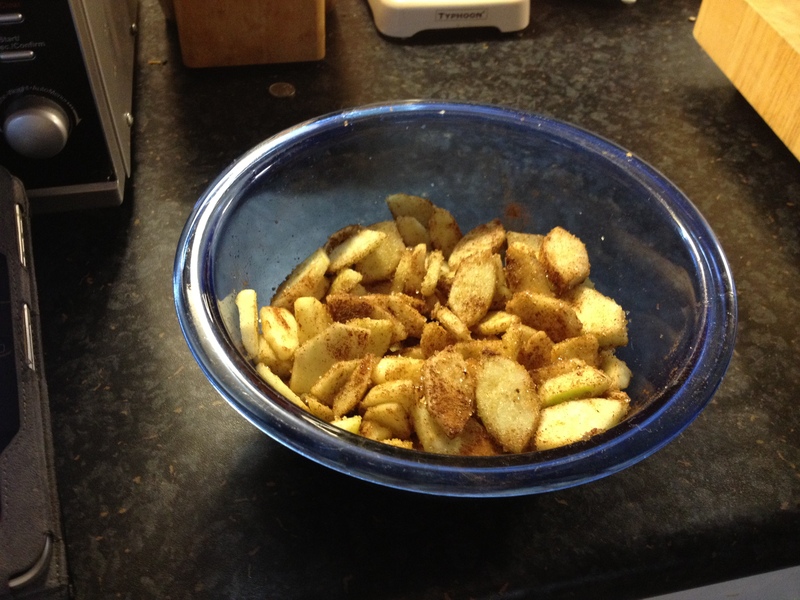 Mix with 25g of the demerara sugar and the cinnamon until well combined. 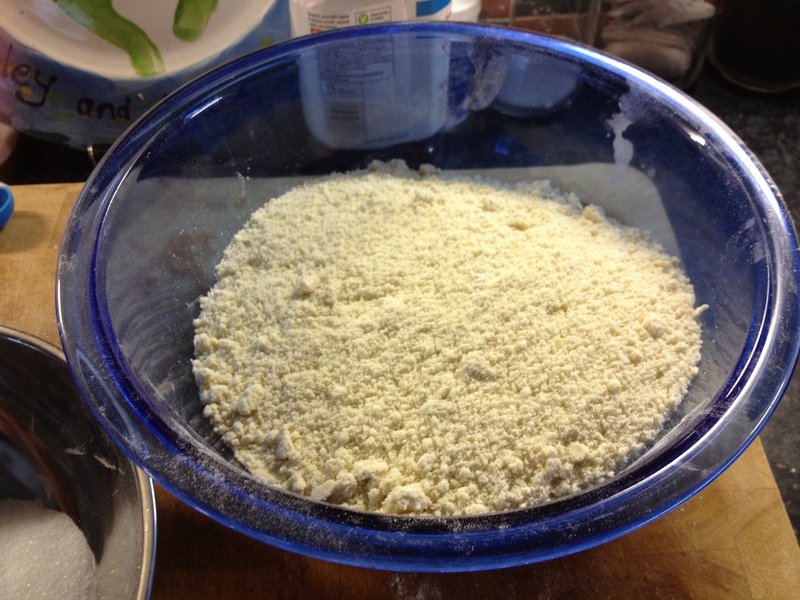 In a separate bowl, sift the baking powder and flour in together then rub the butter in until you have fine breadcrumbs (or make life easy for youself and pulse in a food processor until you have the same effect). Stir in the caster sugar. 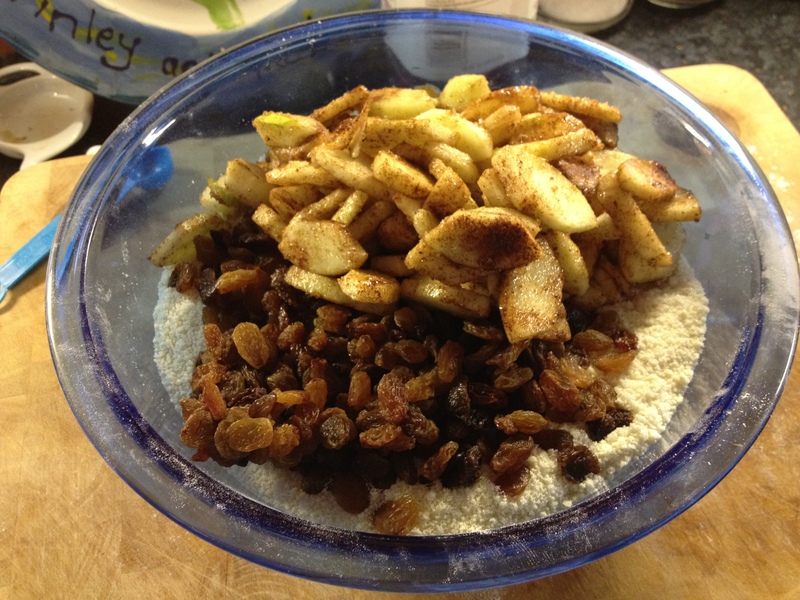 Mix the apples into the flour mixture, followed by the raisins or sultananas. Stir in the eggs and enough milk (you may not need the full amount) to form a soft, gloopy dough which dollops easily of the spoon when you lift it up. 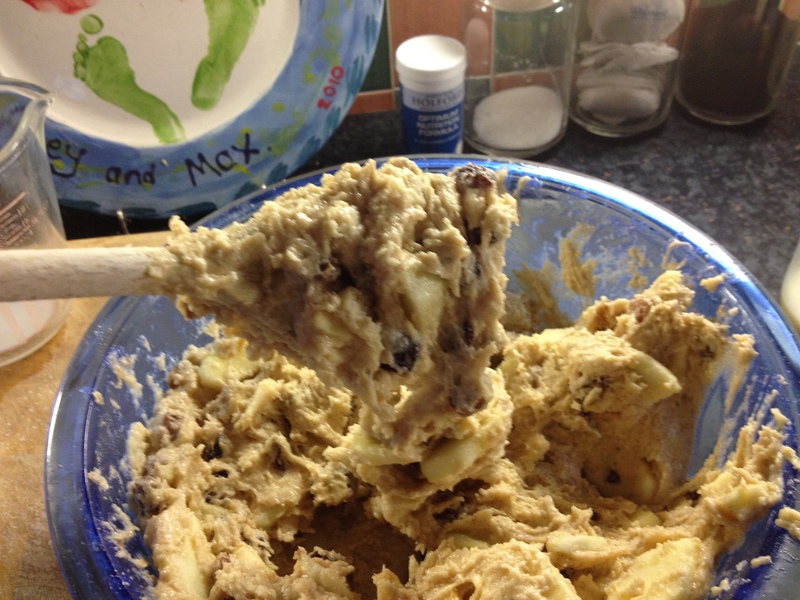 Spoon the dough into the prepared tin, level out and sprinkle with the rest of the demerara sugar. Bake for 1-1.5 hours until a knife inserted in the centre comes out clean. If the top starts to burn, pop a bit of tin foil over the tin. Leave to cool in the tin for 15 mins before turning out onto a wire rack. I have never managed to cool this cake completely. It’s at it’s absolute best when served warm, in a bowl, with masses of custard. Delish. Enjoy! Posted in Baking and tagged baking, cake. Bookmark the permalink. It’s easy to get caught up in life sometimes and not enjoy quality time with the family. Last year I made a conscious decision to do something each day just for the boys, to give them my full attention and forget the dishes, washing, and domestic humdrum which often takes over. 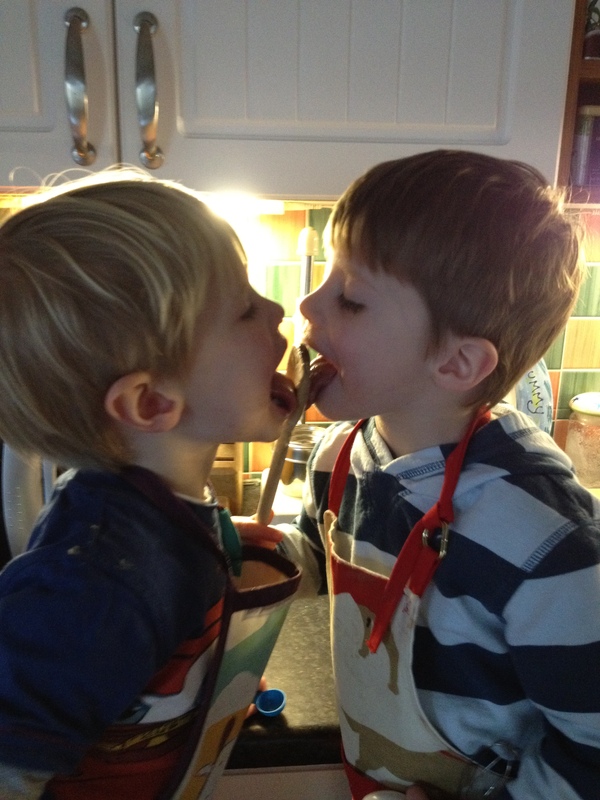 Like me, Max and Finn love baking. I guess what we enjoy naturally rubs off on our children as that is the thing we’re most inclined to do with them. 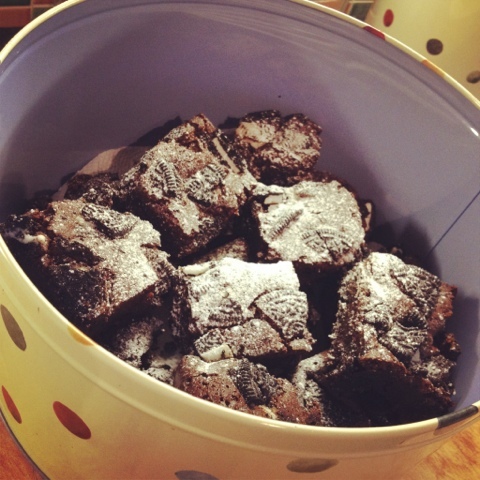 So once a week, we don our aprons, raid the cupboards and spend an afternoon baking. I want the boys to grow up with a healthy relationship with food and don’t believe in banning anything. I want them to enjoy chocolate, cake and biscuits but in moderation, limiting them to once or twice a week. If they are going to eat sugary food I want to make sure I know what’s in it and by making it myself I know it’ll contain less nasties and chemicals than shop-bought alternatives. 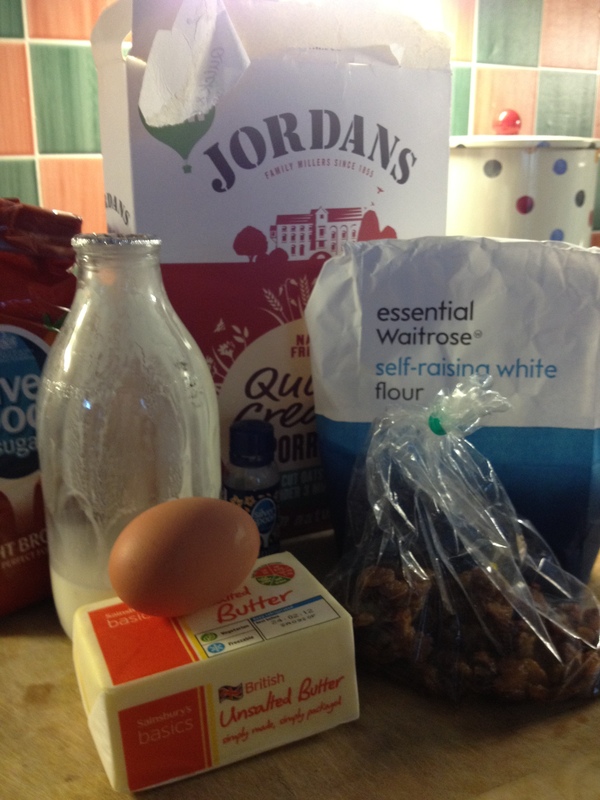 I’ve decided to start a new feature on the blog, a weekly recipe featuring the cake or bake of our afternoon session. 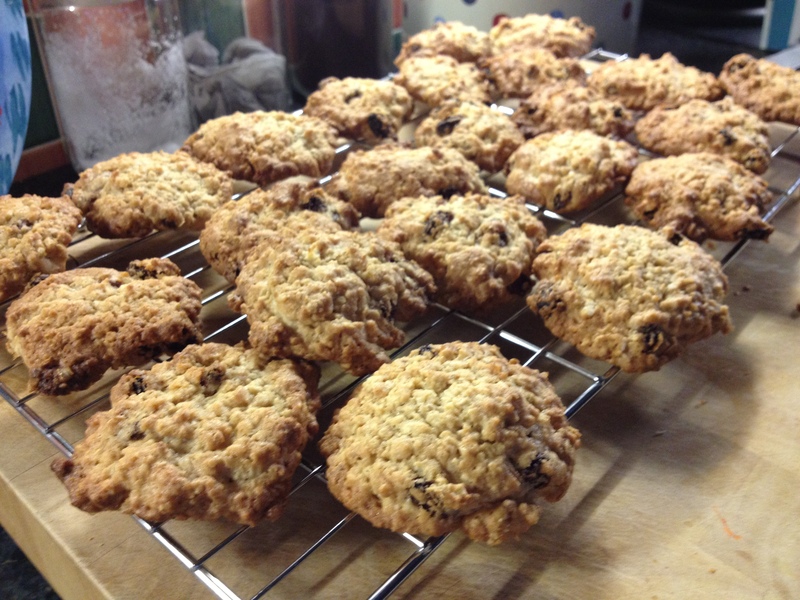 This week we made oat and raisin biscuits, as featured in The second Great British Bake Off book. Heat the oven to 180 c/350 f/gas 4. Cream the butter and sugar together until pale and fluffy. In a separate bowl whisk the egg, milk and vanilla esscence until just combined then add to the butter mixture. 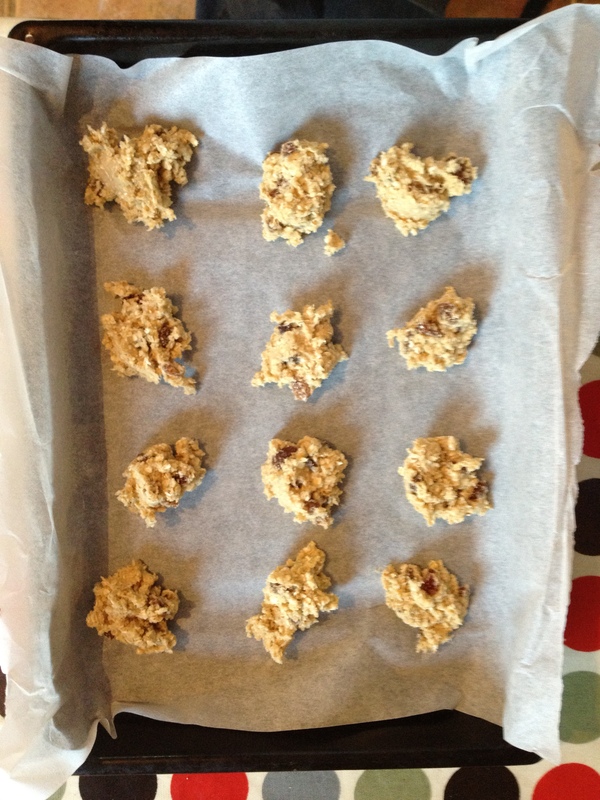 Stir the flour, oats and raisins into the mixture, mixing well with a wooden spoon. Dollop heaped teaspoonfuls onto a greased or parchment-lined baking tray. My mix made 28 biscuits. They need to be well spaced as they’ll rise and spread as they cook. I did them in 3 batches. Bake for 12-15 minutes until golden. Remove from the oven and leave for a few minutes to cool in the tin before cooling completely on a wire rack. The recipe states that they last for up to 5 days in an airtight container but they are so good, I very much doubt they’ll last that long. Posted in Uncategorized and tagged baking. Bookmark the permalink.